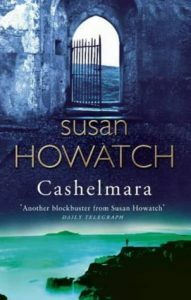 If you love huge multi-generational family sagas, meaty soap operas encompassing love, lust, cruelty, murder, and revenge, Cashelmara by Susan Howatch may be for you. This 700-page novel, covering thirty years and three generations of an aristocratic English family, is set in 19th-century Ireland, against the backdrop of the Irish potato famine and struggle for independence from British rule, but the basic plot comes from much earlier events. The story is a fictionalisation and transposition of real events from the reigns of three kings of England—Edward I, II, and III—in the early 14th century. That the novel is a retelling of the lives of real people made it all the more compelling and emotionally wrenching. The narrators are all, to a greater or lesser degree, somewhat unreliable, and believably human, with both good and bad qualities. Their likability scores are in inverse proportion to how hard they try to make themselves look sympathetic. The most honest and self-aware are Edward and Ned (and to a lesser extent, Marguerite), bookending the story and trying to cope with the mess made by Patrick and Sarah in between. The book starts off with Edward looking like an old fool fallen for the lures of women interested in him only for his position and wealth, but then he slowly reveals himself to be much more savvy, and to have a genuine loving relationship with his young wife, as well as the respect of his Irish tenants. Edward, Marguerite, and Ned are decent, responsible people struggling to deal with the hard punches life throws at them. The 200-page saga of the relationship between Edward and Marguerite could have been a book on its own, and in some ways a more satisfying one. But the primary plot driver—the conflicts between Patrick and Sarah—doesn’t kick in until a third of the way into the book. Patrick is a closet homosexual in a culture that considers his sexual orientation perverted. He could have been a sympathetic character, if he hadn’t also been an easily-led man-child caught by accident of birth in a position of great authority. His choices of despicable lovers and his own foolish and irresponsible behaviour does serious damage to dozens of other people, most particularly his wife and children. His wife, Sarah, isn’t without fault or blame. She’s a spoiled brat, neither she nor Patrick have the slightest bit of self-control, and her affair with Maxwell puts what she claims to value most—her relationships with her children—at risk. Maxwell seems, at first, the most ambiguous character. I was inclined to be sympathetic towards him, as the underdog Irishman unwilling to bow and scrape before the English overloads. Patrick’s claim early on that he was a murderer didn’t seem to have any facts to back it up. But then Maxwell gets his turn at narration, and shows us what kind of self-aggrandising, murderous thug he really is. But even he isn’t completely irredeemable; he treats Sarah and her children as well as knows how. These three—Patrick, Sarah, and Maxwell—are not nice people. The story bogged down for me in the second half of the book, because I didn’t particularly like being in their heads. Maxwell was the most unpleasant, and far too much of his section was a diversion from the main plot. I would have quit reading then if I hadn’t already invested so much time getting to that point, and I wanted to know how it turned out. I’m glad I didn’t give up because the narrative momentum picks up again in Ned’s tale, and he is the most appealing character of the lot. From an early age, he shoulders adult responsibilities and faces up to grim choices. As strong as his father was weak, he reduces the animosity between two sides in a long-running local feud by sheer force of will and personality, marries the woman he loves over his elder’s objections, tells his shocked English uncles he is not English, he is Irish, thank you very much, and exacts revenge on his parent’s generation for their follies. All while still a teenager. I see this book only appealing to adult readers. While large parts of the novel are engaging with fully fleshed-out characters, it is long and rather dark, with some sections that are hard to get through. The sexual assault is not graphic, but the impacts of the famine are. Not an easy read, but with the exception of Maxwell’s tale, an engrossing one.